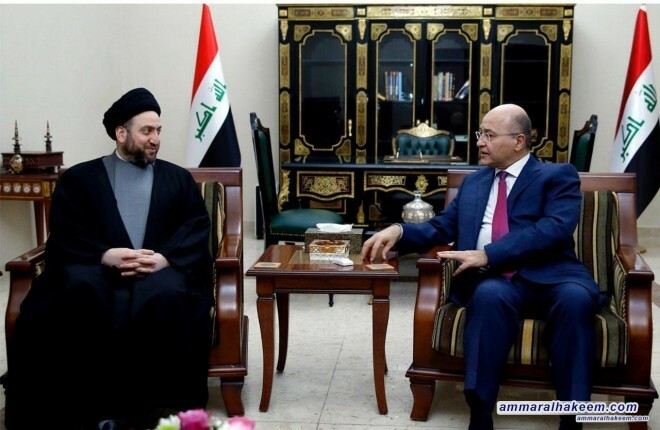 Head of the Reform and Reconstruction Alliance, Sayyid Ammar al-Hakim, met with HE President Barham Saleh. His eminence with Saleh discussed latest developments in the political situation in Iraq and the region, and the role of Iraq by virtue of its historic status, location and social diversity. His eminence stressed the importance of concerted efforts of all in order to enable Iraq to continue the successes achieved at the security, military, political and social levels, pointed to the status of Iraq after showing a great experience in the peaceful rotation of power andthe distribution of roles. His eminence stressed on supporting the government in implementation of its program, provision of services and employment opportunities, and the independence of its political decision, stressed the necessity of proceeding to complete important legislations, especially which related to supporting the government program and necessary for Iraqi political system.